Tandem is about planning your adventure in the same way we plan to enjoy the great outdoors. The beautiful, inspiring, challenging environments found all around the world serve as perfect metaphors for the journey of life that we see stretching before us. Some are gentle and undemanding but less dramatic. Others offer stiffer ascents and increased danger, but with more spectacular views. 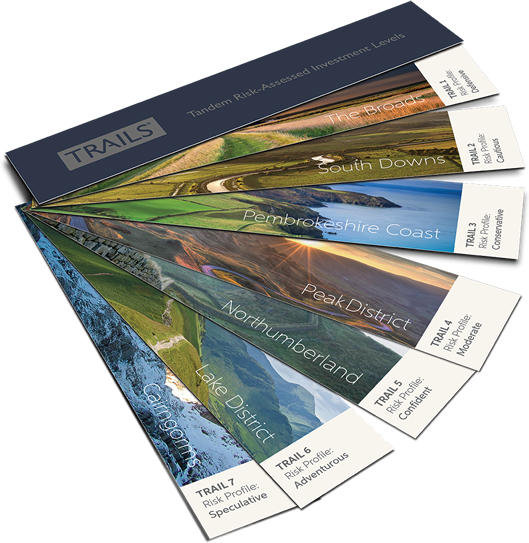 Seven beautiful British National Parks symbolise the different ‘model’ portfolios that have been devised with asset allocations that offer specific levels of risk and potential return. They are the ‘Tandem Risk-Assessed Investment Levels’ (TRAILS™). Their goal is to give you the opportunity to achieve the highest possible level of long-term returns in a manner that is most consistent with your own personal risk profile. The question is: which one of these is yours? Sensitive to short term losses, but still aims to beat inflation over the long run. You are not comfortable with volatility within your portfolio and you are keen to keep risk to a minimum. Still sensitive to short term losses, but with a likely goal of beating inflation over the long run. You seek growth in the real value of your assets over the long term but while minimising risk. Less sensitive to short-term losses you are willing to take on slightly more risk than the cautious investor in order to increase expected return, although risk is still an important consideration. Willing to accept more risk than the conservative investor, but you are probably not willing to accept the short-term downside risk associated with achieving a long-term return dramatically above the inflation rate. Comfortable with more risk than the moderate investor but you are not comfortable with the short-term risk associated with achieving a long-term return dramatically above the inflation rate. You think of risk more as opportunity than uncertainty. Seeking to maximise long-term returns rather than minimise short-term losses. You are more concerned with the potential of financial return than with short-term volatility but you wish to retain some marginal protection against downside risk. Focused on maximising long-term expected returns rather than minimising possible short-term losses. You understand there is no marginal protection against capital risk, since 98% of the investments are in growth assets but you are willing to accept these risks to achieve the best possible return. Past performance is not necessarily a guide to future performance. Changes in exchange rates may also cause an investment to fluctuate in value. Levels of taxations depend on an investor’s individual circumstances and the value of any applicable tax reliefs. The value of investments and the income arising from them, can go down as well as up, and are not guaranteed, which means that an investor may get back less than they invested. If you have any questions related to your investments or the suitability or appropriateness for you of anything described in this website, please contact an adviser at Tandem Financial Ltd. This website is designed only for use by, and is directed only at, people resident in the UK. The information in this website does not constitute legal, tax or investment advice. You must not, therefore, rely on the content of this website when making investment decisions.